A veteran of the LAPD, widow of a Green Beret and self-described crazy cat lady, Martha Boyd fears no questions. Ask her anything in the comments section – no issue is too big, too trivial or too weird for her to tackle, but if you get out of line, she will let you know! All questions and answers are real. Greetings – as some of you know I just returned from another week in Mexico. Stayed again at the Melia Puerto Vallarta. So this time we went on Delta – first time in ages I have been on a plane with a movie and they did not charge!!!!! However we were 1.5 hrs late getting off the ground out of LAX. The return trip was another first; only 40 people on the plane, everyone had their own row of 3 seats – they ran the flight with only that small number, so overall I was happy with the airline. The tour company that we have been using for years dropped the ball badly this time. When you get to the hotel you are given an appointment to meet the tour company in the next day or so to book your return trip to the airport. The company – “Apple Tours” – did not show up. So the wonderful PR staff at the hotel booked the return reservation with the tour company – I understand enough Spanish to know that this did take place. Waiting in the lobby at 12:30 for our 1:00 pm pick up for the airport, again Apple Tours was a no show. I gave them 15 min after 1:00 pm just in case. So back to the PR office. Again she called the company – the tour company sent someone out from the office. We were picked up at 1:25 pm . The PR office even made sure my mom and I got in the cab and that the tour company paid the bill. So anyway, a big pat on the back to the Melia PR staff (office just past the front desk). Very helpful, speak great English. You can tell the hotel puts some of the top people in this office. The front desk is nice but they seem more trained in stock answers and are not good problem solvers. But the PR office is tops. Another shoutout to the activities staff down by the pool. They have a lot of activities that you can do for free (included in your hotel price) and some that are extra like golf. For free you can do water exercise, archery, shooting, climb a rock wall, volleyball etc. Every day the Flintstones come out and greet the kids. So you can just sit by the pool and relax. Food and drink are also included in your hotel fees. They pour name label liquor and full shots. The Melia corp is out of Spain with hotels all over the world. We are planning more trips there for next year already. My mom has also said in 2015 we will be in New Orleans and Boston, so will have to see what geeky things I can find in those places to comment on. Got back to the mom cave in Joshua Tree. It had been raining for 3 days and the property had a flash flood – no damage, but when we get heavy rain I have a seasonal creek that runs near the end of the driveway and also one to the back of the property. Sometimes the house is on an island when both the front and back go. Next time this happens, I will take some pics to show. The fur babies left the house standing but slightly redecorated, so I spent a good share of the first day back picking up things they had relocated to the floor. Typical kids: they drop everything on the floor and don’t pick it up. I even get them a sitter who comes once a day for these longer trips – so I am sure she is picking up a lot of the stuff that I never see. But we are all now back in our regular routine until the next adventure. 12/10/14 was the first anniversary of my husband John’s passing. So we made it to the 1 yr anniversay. Last year LYT wrote a great tribute to him. 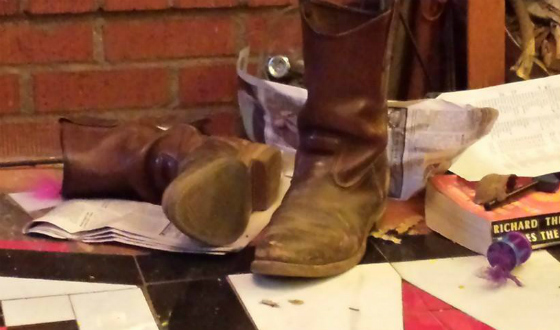 I attached this week a pic Julia did of John’s boots – he always wore boots. They only time he wore regular shoes was the day we got married. 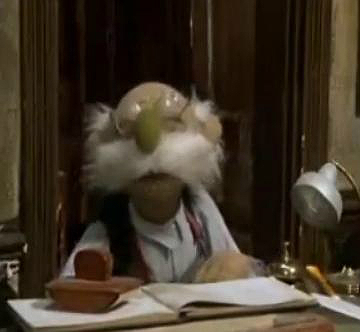 Also the pic of the Muppet that LYT thought looked like him. John had a great mustache. LYT now owns one of John’s Stetson cowboy hats that was also one of his trademarks. Well anyway. on to happier things. I am starting to put up the Christmas decorations so when I get them done I will post some pics. Not sure how much will get done on this, but I am determined to try and do it; it used to be a family project – but now my little helpers only have paws and they find it more fun to pull things down then put them up. This will be Love Bug and Pirate’s 1st Christmas, so the tree will need to be firmly secured to something. Let’s see what you have for me this week. How do you think Disney will react if Age of Ultron gets better reviews and performs better at the box office than Star wars VII does? They will probably be pretty happy. Anything SW is pretty much a given, so if the other does good they should be happy. I manage a busy location of a cell phone mining company. I have a great staff, with one exception. There’s an 18 year old girl who wants to do what she wants instead of doing things according to Cpmcorp policy. Little things like not getting up and greeting customers at the door, but waiting for them to come to her. No matter how often I correct her, as soon as she thinks it’s OK , she goes back to the old behavior. Is such headstrong behavior common among the young ones, or am I just blessed? Well, with her being 18 I think you are blessed at this point. Hopefully she will change. Make sure that you write up these issues in her file, just in case you need them later to fire her. You may also be able to change the behavior if she loses a merit raise – money talks. Or if you have an employee of the month, quarter etc with a little gift and she does not get it, you will be able to show her the file and documentation. She should greet them in some form even if from her desk when they enter. Running up and getting them at the door does sometimes offend people. I know that there is one store in my town that as soon as I open the door and step in I am landed on by an employee; it is like they are seeing who will get the sale. I find this annoying and only go to this store when it is totally necessary. I don’t go to look around and maybe impulsse buy. However from the desk a nice hello, welcome to, if you need help let me know is fine. I hate employee stalkers, as I call them. She may have a similar issue and does not like the in-your-face way of treating a customer. Perhaps policy should be re-looked at by corporate? Once I’m back I’ll try remember how many times I covered it, how many times it hit and let you know in that weeks Q&A. I like 28. Next fav is 16. Let me know how it turns out. My fav game is the quarter blackjack. Have found that the best payoff is if you play 5 at a time. Knew someone who had a friend who worked in Atlantic City, and they said that they see the most payoffs if you play the full five. The machine just tends to eat the money if you only play 1 or 2 coins. I like the casino at Circus Circus the best, followed by Hard Rock, and MGM Grand. The Penn and Teller show is always a must-see, as is Blue Man Group. The seafood buffet at Rio is really good too. Dear miss Boydapraisal, The holidays are coming up, and I’m interested in trying new recipes for desserts. Are there any good desserts you like that you think I should look into? 1 carton of peppermint ice cream – slight soften in on the counter or in microwave. Don’t let if fully melt – just get it a bit soft so is spreads. Put it in the crust. Then I crush a couple of candy canes and sprinkel them over the top of the ice cream. Put it back in the freeze. When ready to serve, take it out about 5 minutes before, to cut easily. I top it with either chocolate sauce or a whipped topping. Or both. #2: to fancy up a whipped topping – the kind you get in a tub at the market. Crushed candy canes stirred in is good. Also I have found that if you put some in a flavoring like rum, coffee liquor, etc and stir, it makes for a different topping and can spruce up what ever you are using it with. Also makes a different topping for hot cocoa or coffee. 3 packages of cream cheese – any brand will do. Melt the cream cheese in the microwave until soft. Stir in around 1/2 of the can of the condensed milk to start. If you like it sweeter the whole can works. Stir the cheese and milk until fairly smooth and pour into the pie crust. You can, if you like, add flavor to the mixture. I have in the past used pumpkin spice, apple pie spice and coffee liquor. All are good but start with small amounts and do it to your taste. Set the pie in the freeze, but remove about 10 min before serving so you can cut it. This is also good topped with whip cream, or canned pie filling our favorite canned pie fillings are blueberry and key lime. Fresh fruit is also good if you want to take the time to cut it up. These generally always show up at my house for special times. dear LMIL can i call you mamasan? Also would you allow me to gift you an occupy mars t-shirt…If so, how ever is comfy for you, lemme know a size. also color choice, wht/blk/ltgry/dkgry LYT can forward. Hello and yes you may. Thank you for the T-shirt – that is so kind of you . I see that LYT has answered the size and color question. I wear my Toplessrobot T when doing events for them, but I can also wear the Occupy Mars one – that will be lots of fun. If you don’t have enough of the XLarge I can also do Large shirt sizes vary so much. Thank you again for the kindness. Or, a little more classical, Why a duck? Because duckies are cute and are really good when they are rubber and yellow and floating in my tub or swimming pool. I have them there too. Are you Team Martha (Stewart) or Team Gwyneth (Paltrow)? Old school Martha Stewart. Love watching her shows. Also we Marthas have to stick together. “Ive seen jars of horse ejaculate” There seems to be a disturbin trend, toy horse involved in sexual situations, a happening. Sup with that? Gee, I’ve totally missed this. Have seen some horse play sets out, but they are all kid user friendly. What’s the worst superhero TV show ever? My vote would go to The Tick followed by Greatest American Hero. What’s the dumbest hat Johnny Depp has ever worn? The one as Willy Wonka, but I am waiting to get a really good look at Into the Woods; that may or may not be better. A very very bad man in England. Some say he was a doctor. Did anyone actually like Warriors of Virtue? No clue; I never saw it. Read the Wiki on it and it sounds pretty lame. What Steven Spielberg film suffers the most from his famous daddy issues? Wow, another thing I missed – didn’t know he had daddy issues. Well group, another one in the can so to speak. Today starts year 2 of being on my own. I survived year 1. December is starting to fill with Christmas things to do. This weekend is Julia’s birthday so going to drive partway and meet them for lunch. That should be fun and hopefully between storms that are heading our way. Weather is predicting a real bad rain for Friday, but clearing for Saturday/Sunday. Hope so. Don’t like to drive in the rain. The next screening at the JT film fest is on 12/18. Still trying to find out what will be the movie. Anyway, as always be good to each other this next week. Keep the questions heading my way. Huggs. Got questions? Sure you do! Ask them below and be included in a future column.